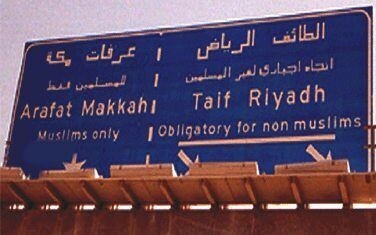 Saudi traffic sign indicating that only Muslims may enter Mecca. Nirosh Kamanda, a Christian from Sri Lanka, had a visa to work as a truck driver in Dammam, a town on the Persian Gulf. But after a short time, he illegally left his job and even more illegally entered Mecca – strictly forbidden to non-Muslims – where he sold goods near the Grand Mosque. When questioned by the police, he claimed he had overstayed his umra visa, which allows a Muslim to go on pilgrimage outside of the hajj season. But the police, benefiting from a new fingerprint system, quickly established who he was and arrested him. Kamanda admitted his identity and having come to Mecca to earn money. "I heard that Makkah is a safe place, where I could hide my identity." Comment: (1) One wonders what Kamanda's fate might be. Deportation, prison, corporal punishment, or even death? May 20, 2009 update: Aymenn Jawad writes in a comment to this blog today that "Nirosh Kamanda was detained and sent to Jeddah. He then faced a trial in a Shari'a court with the Minister of Interior deciding on a punishment based on the recommendations of a judge. However, his fate after this is unknown and will probably never be revealed."